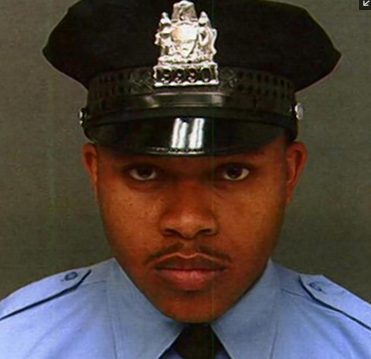 Philadelphia Police Officer Robert Wilson III was shot dead Thursday in a GameStop by assailants who were about to rob the video game store, the Philadelphia Inquirer reports. Wilson, 30, was in the store carrying out his patrol duties when the attempted burglary began. Wilson engaged the robbers and gunfire was exchanged. “Officer Wilson was able to get off numerous rounds. Both suspects were, I am told, on either side of Officer Wilson firing at him at very close range, and even though he was being struck multiple times, he continued to fire until the fatal shot was fired,” Philadelphia Police Commissioner Charles H. Ramsey said. One of the shots hit Wilson in the head. He was rushed to the hospital and pronounced dead shortly thereafter. Wilson was the father of two sons: a 9-year-old and a 1-year-old. “He was one of the best police officers this city has to offer,” Ramsey said. Wilson’s partner, Officer Damien Stevenson, was outside the store and exchanged shots with one of the assailants after hearing the gunfire, Ramsey said. One of the alleged assailants was shot in a leg, and another initially tried to escape capture by hiding his gun in his clothes and blending into the crowd, but he was caught at the scene. Both men were arrested.